I know, I know. It's Wednesday, not Sunday. 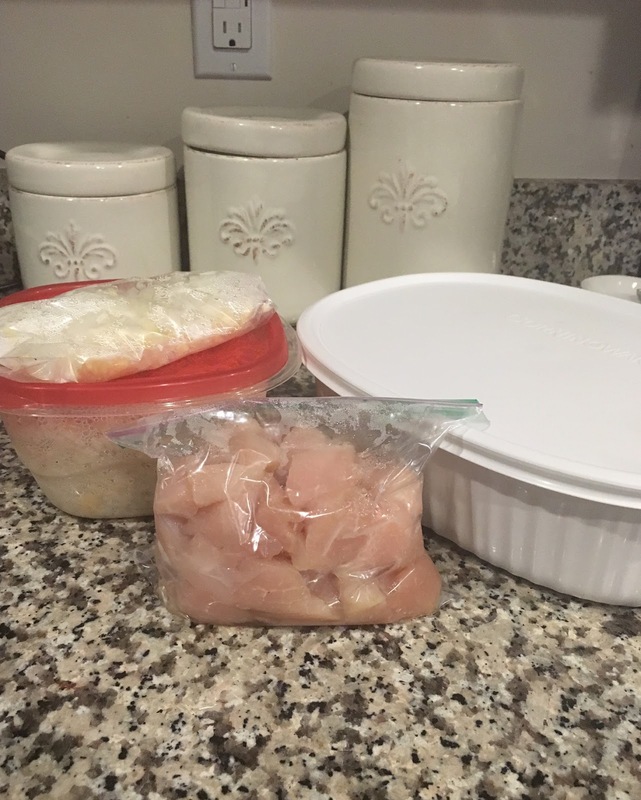 But I spent a lot of time meal prepping this Sunday and approached our meals this week a bit differently, so I'm sharing! Cause sharing is caring. For a while, I've been making about four to five meals a week. After going to the gym. It's tiring and the past few weeks, I've been really susceptible to things like Subway and Cookout. It's just easier. So, I've changed it up. I'm trying to do two big meals and eat off the leftovers during the week. Then I only have to cook twice a week - once on Sunday and again on Wednesday. This is our first week trying it, so we'll see. Here's what we have this week! 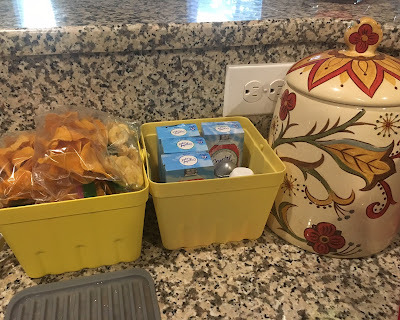 We are all about snacks in this house. 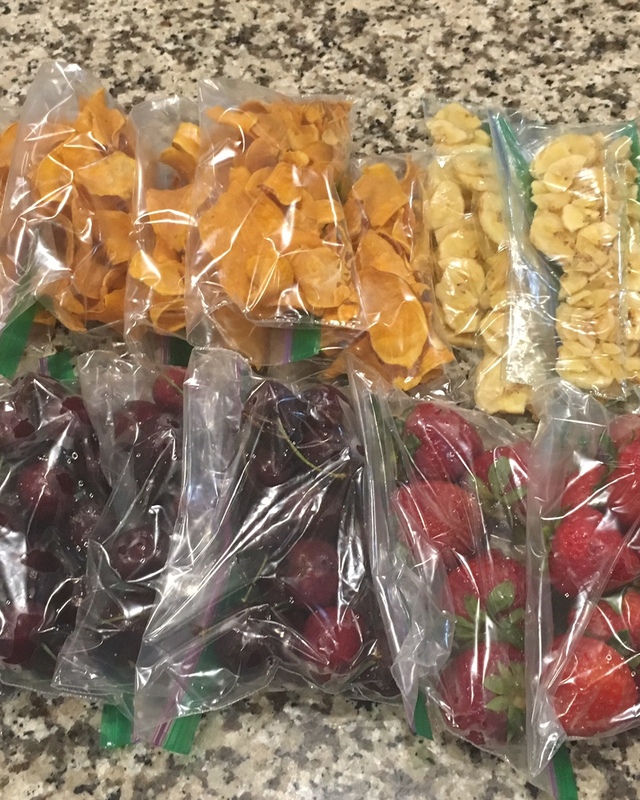 I got pretty good at not snacking as much with Whole 30, but then I have gone back to a morning snack and an afternoon snack. For me, smaller meals just work. Plus, Aaron is outside during the day and has breaks, so I make sure we have some good snacks. I buy in large bags and then portion everything out Sunday night. I've been on this banana chip kick. It's actually the best of both worlds - I like the banana flavor, but not the texture. With chips, I don't get the mushy texture of a banana. I've been buying this Mariani brand and I really enjoy them! These are my favorite chips! I found them during Whole 30 and I have been hooked ever since. It's just sweet potatoes, coconut oil and sea salt. Even Aaron loves them! I buy multiple bags at at time from Thrive Market and then portion out into little snack bags. I always try to have fruit on hand for snacking. Last week I had cantaloupe, this week it's cherries and strawberries! I keep all of our non-perishable snacks in a basket on the kitchen counter beside the cookie jar and our drink mix basket. Everything is right there together, so you can just grab and go at once. I made two meals this week: PaleOMG's Pizza Spaghetti Pie and the Pioneer Woman's Mexican Tortilla Casserole. The links are to the respective recipes. You're welcome. I went ahead and made the Pizza Spaghetti Pie Sunday night. I didn't make it until late, but it heats up really well. It's a meal I always make on the weekends because it takes a while. Even if you prepped the spaghetti squash beforehand, you still have to brown the meat and then bake for an hour. It's a long time that I don't have during the week. We both really like this recipe and sometimes I jazz it up with some cheese (not Paleo) and pepperoni. 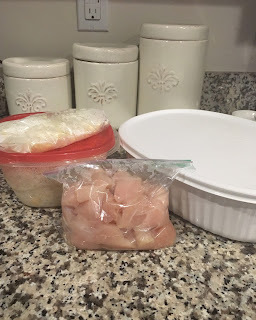 For the casserole, I went ahead and chopped the onion and garlic, made the rice and cubed the chicken. I thought about going ahead and making the chicken, but I was getting tired. By doing all of the chopping ahead of time, I can literally dump everything in the pan and cook it after class. Then I just need to build the casserole and bake for 20 minutes. I haven't made this one before, but I'm pretty sure I can handle it! So far, I've enjoyed this type of meal planning. I'm making the casserole tonight, so we'll see how it goes. But not having to cook Monday night after class was amazing. I'm pretty sure Aaron is enjoying less nights of doing dishes too! Another bonus is I'm pretty sure I'm wasting less food. I always have grander plans for meal making than what actually happens.